This was originally built in Shirakawa-go, small traditional villages located in Gifu Prefecture now designated as one of UNESCO's world heritage sites. Among all the buildings in Sankeien Garden, it is the only one whose interior is open to the public at all times. Although it was designed for farmers, the building features high-class architectural elements, such as the spacious entrance hall for guests, tatami mats in the reception room and the windows with distinct designs often seen in Zen Buddhist temples. 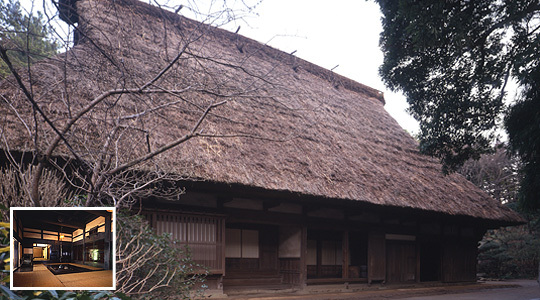 This is one of the largest gassho-style private houses that still exist in japan. Inside the house displays the farming tools used in the Hida region. There is irori ( a fireplace in the middle of the living room floor) , which is fed with logs everyday.